The Centre for Ecology & Hydrology (CEH) is establishing the first UK large area soil moisture network. The COSMOS-UK network delivers exciting new data showing how soil moisture varies across the country with soil type, climate and vegetation. COSMOS-UK stations also measure the weather and other environmental variables. COSMOS-UK has great potential to transform hydro-meteorological modelling by providing real-time data for assimilation and model validation. Leveraging the new technology of cosmic-ray soil moisture sensing makes our measurements representative of areas up to 700m in diameter, which averages the inevitable small-scale variability in soils and vegetation. COSMOS-UK is funded by NERC as part of the RCUK Capital Investment Strategy. The COSMOS-UK network and its website are under rapid development – new field sites and web features are being added over the coming months. 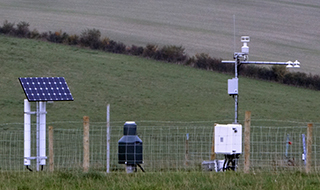 The first five COSMOS-UK network stations are located at established CEH research field sites and by mid 2014, the network will be expanded to incorporate a further 25 stations. View the COSMOS-UK website here. The CEH COSMOS-UK team is keen to receive your feedback. The COSMOS-UK network will contribute to CEH soil science activities and will underpin a range of science areas.